New information from the Caltrain business plan highlights the redundancy of VTA’s planned BARTÂ segmentÂ from San Jose Diridon to Santa Clara station.Â Caltrain’s new data shows that there is so much pent up demand that the Caltrain line is likely to get crowded again, even with capacity increases. 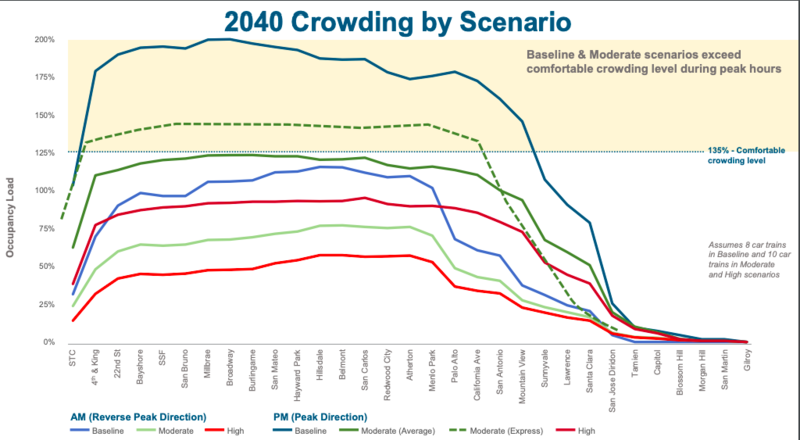 But, even with the highest capacity increase option that the Caltrain board is considering, the segment between Santa Clara and San Jose will have plenty of room. So VTA’s plans to extend BART from Diridon Station to Santa Clara, with tracks running parallel to Caltrain, and a brand new station parallel to Caltrain, will spend hundreds of millions of additional dollars, not counting the operating funding, to create new rail capacity where is already plenty of room on a rail line that the region has just spent $2Billion to electrify and upgrade. Connecting BART from the Berryessa station, which will be the end of the line in the current phase of the Santa Clara County extension, to Downtown and Diridon with many homes, jobs, and educational institutions, and connections to Caltrain, VTA and other regional transit, will be beneficial.Â But the Caltrain information is more evidence that the redundant Diridon Santa Clara segment is wasteful. Meanwhile, VTA is studying a range of high capacity transit corridors, including the Stevens Creek corridor with the County’s second highest ridership bus line. For many years, the extension from Diridon to Santa Clara has been considered politicallyÂ untouchable, because Santa Clara’s voters have historicallyÂ preferredÂ blue BART trains over red Caltrain trains. To be fair, the original plans for the Santa Clara County BART extension were made back when Caltrain ridership was a fraction of the current ridership, long before Caltrain electrification was fundedÂ and under construction, and before theÂ recent Caltrain business plan is setting a vision for much moreÂ level boarding, making it functionally equivalent to BART. 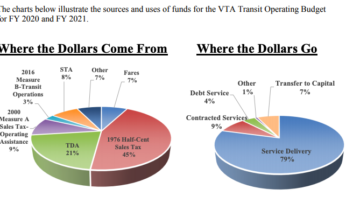 Now, as VTA’s leaders wrestle with a financial crisis, where they are needing to cut service per rider, there may be greater willingness to update capital plans to fit current realities, and current land use plans. VTA will be working on their upcoming two year budget in April, May and June, and the efforts to complete the funding for Phase 2 of BART to Santa Clara will be happening in the coming year. BART is extending from diridon to Santa Clara because it needs a car maintenance facility for the extension, and obviously there’s no space for such facility in downtown San Jose. Maybe instead of Santa Clara, run it underground directly to SJC? The VTA 10 bus is pathetic. It’s still running longer trips to Santa Clara Caltrain rather than SJC where it could be significantly faster and more useful. Even if they need a storage area, that does not mean that they need to build a duplicate station and to run redundant service which will cost extra operating funding.